A while back we asked anyone who wished to upgrade to the new manual to send in their address. We sent out a notice of the reduced price of manual for upgrades, and then sent out a large number of manuals, to all the addresses we received. Gentleman aviator Marv Hoppenworth with William Wynne. Below is a link to a family story written by Pietenpol builder Terry Hand. It is an account of taking his father, a US Navy Seabee in WWII, to see the memorial in Washington on the occasion of his fathers 88th birthday. I have read the story several times and find it moving, and I asked Terry if we could share it with Corvair builders. Every week I have people forward me stories from anonymous sources about servicemen they never met nor heard of before. The stories are often, neat, tidy and contain an unambiguous uplifting moral message. Some of these stories evoke Vietnam infantryman Tim O’Brien’s quote about war stories. Conversely, Terry story, about his own father, draws more questions than it answers. It mirrors the experience of many son’s of such men, sons who found their fathers very reluctant to say much of anything about what they had seen and done in their youth. Buy a mixture of luck and persistence, Terry discovers a key that unlocks some insight to his Father’s experiences. Well worth a careful read. Above, Terry Hand with his steel tube Pietenpol at CC#24 in Barnwell, SC. Terry also has a wicked sense of humor, ‘refined’ by years in the Marine Corps. 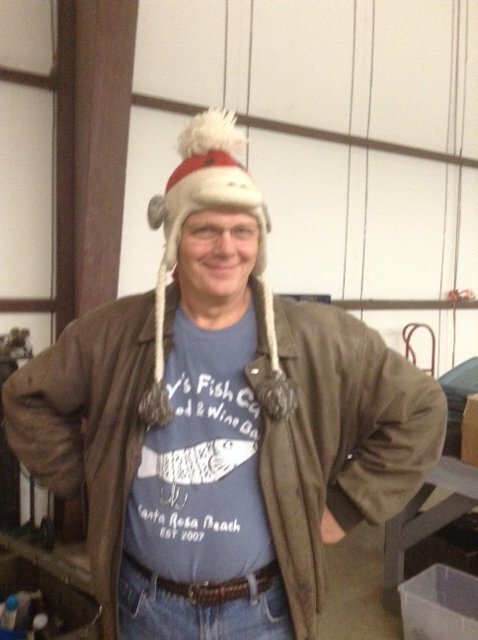 Above he is intentionally provoking an inter-service rivalry by wearing the “Hat of Power” normally reserved just for CC#22,28,32 host Kevin Purtee. This is a major protocol violation. The photo is from late at night, Barnwell College #31. Terry and fellow Marine Andy Shorter were joking around saying things like “The Marines have been sent in Force…Two….why so many?” We expect this stuff on the day before the birthday of the Corps (Nov. 10). I am looking for a set of Volmer plans to buy. I am not going to build the plane, I just would like to study the relationship between the CG range of the wing, the location of the step on the hull and the amount of dead rise at different stations. Claude Delebruere ‘s Corvair powered Volmer in a photo taken about 10 years ago. Mail Sack: Builder Questions, #1 RV-9? Here is the first of a new series, where I take actual letters from builders and answer the questions here, where the answers can serve many builders. Because the writers sent in the questions as private email, I have trimmed their name off the email to respect their privacy. Their questions are in blue, I put the answer in black. You can click on the colored links in the answers to read stories with longer explanations. Would you please answer some questions for me? 1. I have a Corvair conversion manual, #7856 that I purchased when I met you at the Arlington Washington airshow probably 6 years or more ago. It is a 2006 version. Is that still the most current version of the manual? The manual has had many small updates since then, but if you read this site and keep up with the comments here, you do not need a new manual. Since 2006 we have written a very popular flight ops manual that you should consider. 2. I have found 2 engines – an RB and a YN. From your manual it appears that I could use everything minus the heads from the RB engine and the heads from the YN – if I bought both of them. Is this true or would you recommend waiting for a better engine? The RB is a 140 HP manual transmission engine. If the crank does not need to be reground, you can magnaflux it and use it as it with a Dan Gen I bearing. Read this story: Getting Started in 2013, Part #5, ‘Allan Able’ short block. If the YN engine is a 1964 (it could be an un-useable 61-63) The heads will bolt on and work. 3. Would I have to re-nitride the crank from the RB engine or just do a magnaflux inspection? 4. In your manual and web pages you say that an engine should cost no more than $150 to $200. Is that still what most used engines are going for? $250 to $300 is more common these days but plenty of guys who run adds on craigslist looking for engines pay less. 5. Has anyone used a Corvair engine in an RV-9 or -9A? The only model RV that has flown on a Corvair was a -3. The guy had it on there and flew it for several years, but had issues. He had a turbo, injected 3,100, not really what I would call simple nor representative of how we suggest people do things. For all this work, it was not significantly faster than Dan’s 3,000 cc Panther prototype, which is totally reliable. You can’t really blame the engine for not being what some people wanted. 6. If not – why not? 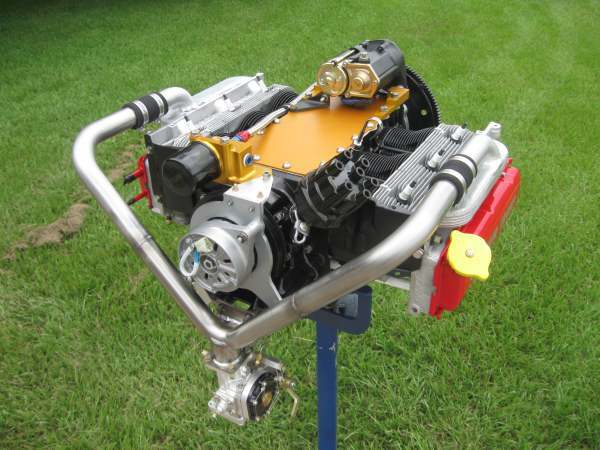 I think a 120 hp Corvair engine with the Weseman billet crank is a perfect fit for the RV-9. Even with all of the successful CH650/Corvair installations, I think the RV-9 is a better airplane than the Zenith, even though the Corvair engine would have to be moved ~7″ forward in the RV-9 to stay away from the aft CG limit. Some people like Van’s products, others like Zeniths. You should build the one you like. I am sure the combination would work, but just about every RV-9 I have seen, including the one that belongs to my next door neighbor, has 150 or more HP. RV-9 would probably be faster, but the Zenith would get off faster and might have a better climb rate. It will take 1/2 the time to build a Zenith 650. I have spent a fair chunk of time in person with both Chris Heintz and Richard Vangrunsven, and I will say that Heintz’s personal philosophy on individual choice appeals to me more. I have many friends with RV’s but I occasionally get tired of the element of the RV-fan club that attacks anyone who proposes something different, like putting a Corvair in a -9. Those people seem to forget that the RV-1 was a modified Ray Stitts design, and if Stitts had the same attitude, there would be no such thing as an RV-anything. The guy who runs the Van’s Airforce website has made some very negative comments about freedom of choice in flying and turning people into the FAA. In 11 years of working with the Heintz family, I have never found an element like that. I don’t need everyone to love nor understand what I am doing, but it is tiring if the official attitude toward ‘experimental’ is negative. 7. Could you design and fabricate an engine mount for a Corvair/RV9 installation? Yes. It would be easier to start with a an existing RV-9 mount to get the gear leg sockets already done. 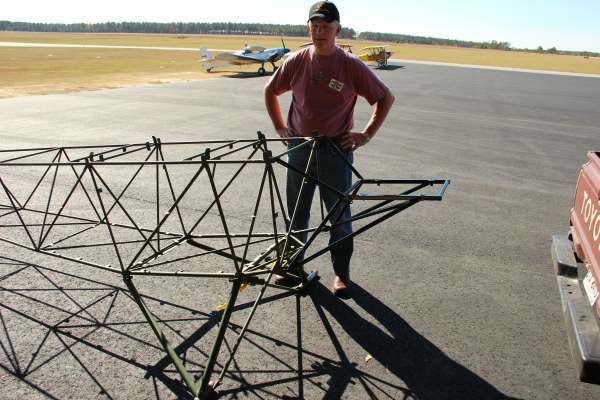 If you would like to see the geometry, it would be nearly identical to this one we built for the Wittman Buttercup:( http://www.flycorvair.com/hangar1209.html ) there are several photos at that website. See picture below. 8. When will you hold the next Corvair College on the West Coast? We are giving a lot of thought to having one in Chino, but I hope to have a California tour before the end of the year, even if we can’t organize a full blown college until 2015. -ww. The letter below comes from Art Blake. It is referencing a comment that I made in the story: Steel tube fuselages, “Safe” planes and 250mph accidents. Art has obviously extensively studied the Corvair option, and after his letter, I will clarify my point on Wooden pusher aircraft. I print the letter here because Art sent it in as a public comment, and I think his enthusiasm for building comes right through. Words many of us can relate to. I am totally psyched. I have not been this excited since my youngest son was born. The kids are settling into happy lives and are contributing to the Common Good. My wife is comfortably situated, and last fall I made up my mind- it is time for me to break these surly bonds, build an actual aircraft, and FLY !! I have the requisite experience: tree houses, go kart, R/C planes, and I even set the timing on my old Chevy Vega, using a light ! And now, now, I read that you would not fly in a wood frame aircraft with a pusher engine. I’m flummoxed, astounded, flabbergasted, crushed. I’m speechless, horrified, bothered and bewildered. The craft I chose, and am so psyched to build and fly, is a Volmer V-J 22, “Sportsman” – yes, A WOOD FRAME AIRCRAFT WITH A PUSHER ENGINE !. From your blogs, I have learned that you are not someone to give a gratuitous ‘pat on the head’ to someone who is about to so something you can not condone, but, can you throw me a bone, man? Will I be building a deathtrap? Do I have to decide between (1) building The Flaming Comet as planned, or (2) riveting together a Belite, strapping on a 1/2 VW, and flying whining circles around the airstrip, like some angry hornet, until either the motor falls off, or I fly it into the trees, just to break the monotony? I suspect you do not say things lightly, and I need to know – is this list of ‘safety preferences’ based on actual statistics, or is it a private opinion, a Gestalt, or the result of some bad experience(s) for you? Help me out, I dyin’ here. I thought your letter was very funny, you are a good writer. When I wrote the comment about wooden pushers, I was specifically thinking of a Rutan Vari-Viggen, (which incidentally, actually flew with a Corvair for one builder in the 1980s) I admire Rutan, but not for that design. You are quite correct that some opinions are formed from negative experience rather than pure statistics. At the very bottom is an excerpt of something I wrote about a disturbing day. Although the stall speed of a Vari-Viggen is listed as 48 mph, compare all the specifications on it’s Wikipedia page to those of a Van’s RV-4, another O-320 powered two seat plane. Although not perfect, the RV-4 probably has a much better statistical record than the 20 vari-viggens that flew. I have experienced friends who have built and flown Rutan designs (Arnold Holmes) and friends who chose not to (Dan Weseman). I consider both of them very good at risk management, but they use their planes differently also. My comments don’t directly apply to the VJ-22, and I will tell you that I have many times considered building one. The low landing speed mitigates a lot of the wooden construction issues, but I would still put a plastic tank in it or a fuel cell, and I would carefully consider what type of terrain I overflew at low altitude. I do this with all aircraft, but my factors would be adjusted with a VJ-22. Of course, it would be a very low risk in an engine out if you were over water. As the story stated, it is all about making your own decisions. Below, an excerpt from our risk management story: Risk Management, Wrong airframe, Wrong experience level. I am writing about a Sunday morning at an SAA fly-in in Champaign-Urbana Ill. The pilot who wisely stopped anyone from calling the man’s wife was our friend Doc Mosher. I was going to ask him how, in the chaos of the moment, he kept a clear line of thought like that, but later reflected that after 20,000 hours and five decades of flying, this was not the first accident Doc had seen.